Phytophthora palmivora infects hundreds of plant species around the world. Determining the genetic diversity among isolates is necessary to establish more effective control strategies, manage resistance and understand epidemiology, long-term evolution of the pathogen, host–pathogen coevolution, and evolutionary processes. 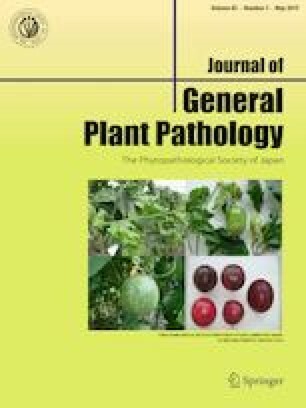 Here genetic diversity among 81 isolates of P. palmivora from various host plants and geographical regions in Indonesia and Japan was evaluated using rep-PCR (BOX, ERIC, REP and M13) and microsatellite markers. With both methods, the isolates clustered into six groups, which corresponded more to geographic regions rather than host plants or mating types, although the respective members of each group were not always consistent between the two methods. Isolates from Indonesia, Japan and other countries clearly clustered into separate groups in the rep-PCR analysis. The rep-PCR consistently grouped the isolates from Sumatera Island with some isolates from Sulawesi, but microsatellite markers grouped them with those from the Java islands. A typical A1-mating type from one region grouped in one cluster using both methods. Both DNA fingerprinting markers also grouped the isolates from Nusa Tenggara and Papua islands with those from Japan. Genetic variation was recognized within and among populations of P. palmivora based on geographical areas, host plants and mating types. Possible explanations for the results and suggested strategies for disease management are discussed. This research was part of doctoral study of Masanto with the collaboration of the Faculty of Agriculture, University of Gadjah Mada, Yogyakarta (Indonesia) and River Basin Research Center, Gifu University, Gifu (Japan) as part of the “6-months Sandwich Program in UGSAS-GU”. The assistance of Mrs. Kayoko Otsubo is gratefully acknowledged.